Happy Thursday! I been slacking this week when it comes to catching up on blog posts and reading blogs. Coming back from a trip tends to do that to me. I am getting back into a routine, but it took me a few days! This week our spotlight weekly theme is sequin and sparkle! I have had this sweater for quite some time and I decided that it was perfect for this weeks theme! I love sparkle and sequins (especially around the holidays). Come share your sequin and sparkle looks with Elle and I! 1. 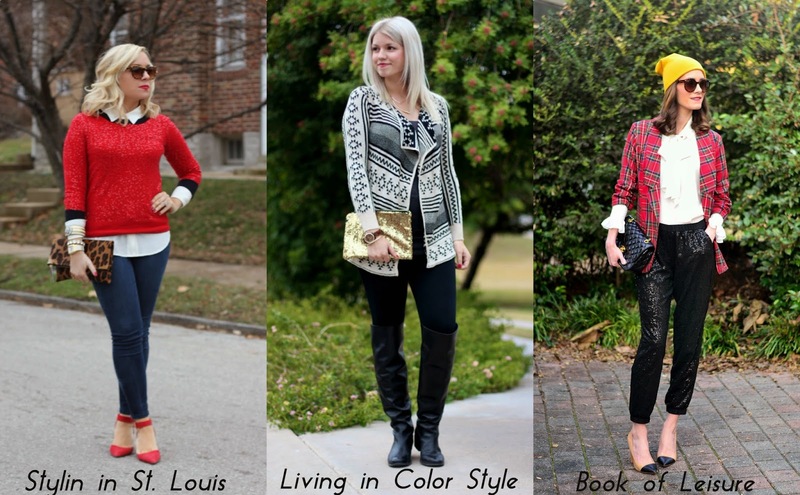 We kindly ask that you follow the two hosts: Elle from Living in Color Style and Jacqueline from Stylin' In St. Louis via Bloglovin or GFC and of course our co-host Elizabeth of Book of Leisure . Spotlight: Our spotlight of the week is Jenna of Sincerely Jenna Marie. 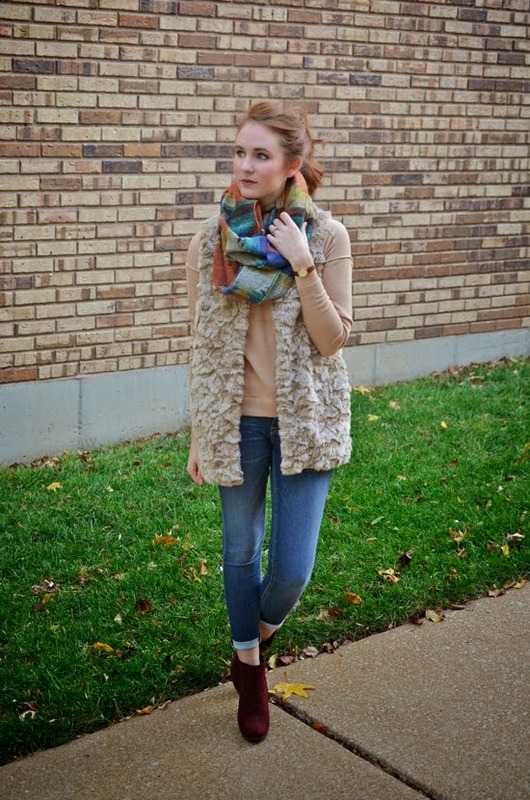 Jenna styled her faux fur just perfectly with her infinity scarf. This look is just perfect for fall. Be sure to check out her cute blog! Next Week: Next week our spotlight weekly theme is green and red style! Thanks for linking up! See ya next week! Who doesn't love a sequin? Perfect look! This sweater is stunning, this is a great look. Love the sequin sweater. It's just the right amount of sparkle for my taste. So fab. Alex - Funky Jungle - Can we talk about ... Pre-Fall Fendi? Gorgeous sweater, the color is perfect and I love how you paired it with the leopard print clutch! What a stunning sweater and it is absolutely the perfect color for you! Love your red sequins sweater, so pretty on you and the leopard clutch goes perfectly with it!! That red sequin sweater is so cute! Love your red sequin sweater and those heels! The leopard clutch is the perfect touch! What a fun sweater, perfect for the holidays! It can easily be dressed up or down. Love a little sparkle- especially for the holiday season! Love your red sweater + pumps here, babe! I didn't even realize the sweater had sequins on it until the closeup. What a fun and festive sweater! Perfect with the leopard accents and those red heels! Love the black, white, and red combination! The sequins on that top are just right. You are a layering master. That sweater is an oldie but will always be a goodie! Perfect with the clutch! thanks for hosting! Totally feel you on feeling behind after a trip! Hope you get some rest! You look amazing and I want your whole outfit from head to toe! Love love love! RED and sequins are so much a holiday thing - and you rock this one !!!! Cuuuute! Love any excuse to throw on some sequins, and your shoes are DARLING! I love sequins! I have always wanted a sequin sweater but I never know if they are itchy or not, but I bet yours isn't! I love all of this red! It's perfect for the holidays! Red looks fantastic on you! Obsessed with those shoes, too!! It always takes me a few days to get back into the blogging routine too - I feel ya! I love that gorgeous sweater - Holiday perfection! You are always the perfect inspiration for colorful and bright looks. Sparkles are always so fun...love it with this shade of of lipstick. P.S. Hope to see you for TBT Fashion link up & enter for a blanket scarf & an amazing mascara giveaway. That is such great sweater! Love how you layered it over the white blouse! Great look! Love love that sweater! Such a fab holiday look! Such a cute look! I absolutely love how you've accessorized this as well! Oh and every single year I KICK myself for not buying this sweater! Ugh! What a gorgeous sweater!! I love you how layered it too. ABsolutely stunning red sweater!! This outfit is so festive and beautiful!! That sweater is absolutely perfect! Love it with the pop of leopard! STUNNING! I love this red sparkly top, so festive and fun!